When Psychomanteum broke up, it turned out to be that Robert C. Kozletsky was active under another moniker as well, Apócrýphos. There was a collaboration with Kammarheit and Atrium Carceri, called Onyx, in 2015 (via Atrium Carceri’s frontman Simon’s label Cryo Chamber), followed by a first solo full length, The Prisoners Cinema, later that year (the latter being released on Cyclic Law; a review on that recording was posted on June 8th 2015). Cryo Chamber recently released the second album of that partnership in between Atrium Carceri, Kammarheit and Apócrýphos, and soon you’ll find a review on that album on this webzine too. 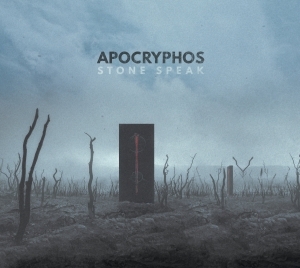 But first some words about the Stone Speak album, which was completely written, performed and produced by the sole member, Robert C. Kozletsky, with both artwork and mastering duties done by Simon Heath. For almost fifty minutes, the listener gets immersed into subtly interacting layers of ghostly, ominous soundscapes, quite dramatic and spooky at times, then again rather mesmerizing and dreamlike (remember: nightmares are dreams as well). There’s a certain minimalism at first sight, but actually there is quite a lot to experience. Especially within the emotional sense, we, dear listener, are subject to visionary adventures within the deepest and unexplored regions of our inner-self. Passages of, well, I’d like to call it esoteric ambience, and excerpts of slowly crawling-forward droning aural waves are combines into truly intriguing sonic artwork, permanently accompanying my thoughts and without letting me to lose attention and interest. Okay, this is not actually danceable stuff, or Music you will be able to reconstruct easily, but therefor it’s like an experience you want to get submerged into time after time. What did impress me most is the thrilling evolution of each single creation. In a mostly organic matter, all compositions on Stone Speak (stoned spoken?) are, the cinematic way (no thanks, dear Simon; it’s my pleasure), build up from, well, as like a seed evolving into a large, monumental tree, subject to all seasons, including the fall of leaves at the one hand, and efflorescence at the other. Despite the long-stretched song writing, this element defines the absorbing atmosphere of the album and the individual, yet highly coherent, songs on it. This was the case in the past too, but on this album that fascinating and permanent enthralment surely comes to its peak, and the minimalistic or nihilistic character (no, I will not define ‘minimal’ or ‘nihilistic’ as a negative or pejoratively used description in this project’s case) is more absent and far-gone than before. I did surely not dislike the former album, 2015’s The Prisoners Cinema, but this new release easily overpowers that former one. Fantastic job done! Highly recommended!